Advance Plastic offers several angle jamb seals designed to seal new or existing angled openings. 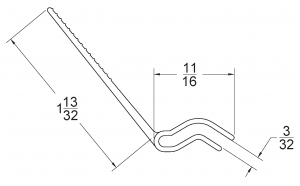 Clip-on reverse angle jamb seals — Seal new or existing angles with a clip-on reverse angle jamb seal such as our popular JS-02 clip-on reverse angle seal. This seal clips into place over a new and existing angles, offering both an economic installation and a solution for angled openings. Reverse angle jamb seals for stucco-finished openings — Seal stucco-finished openings easily using our RS-175 reverse angle jamb seal. This jamb seal is the answer to your stucco finished openings! Install the reverse angle jam seal with either nails or screws. The flexible flap can be installed so that it is either visible or hidden behind the jamb. Our reverse angle jamb seals arrive on large 100- to 150-foot rolls and are available in several standard industry colors. Browse the selection of angle jam seals below or contact us at 847-674-2070 for assistance.